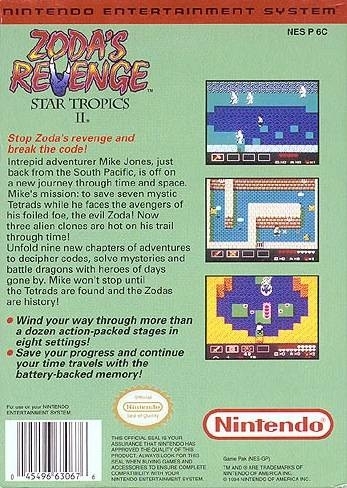 Stop Zoda's revenge and break the code! Intrepid adventure Mike Jones, just back from the South Pacific, is off on a new journey through time and space. Mike's mission: to save 7 mystic Tetrads while he faces the avengers of his foiled foe, the evil Zoda! Now 3 alien clones are hot on his trail through time! Unfold 9 new chapters of adventures to decipher codes, solve mysteries, and battle dragons with heroes of days gone by. Mike won't stop until the Tetrads are found and Zoda is history! Yeah, finally released on VC! This is one of the last Nintendo published NES games to not be released on the VC. I hope that changes soon.